I was stopped at a red light while en route to my first time at Americana at Brand, the luxurious shopping mall in downtown Glendale. I knew I had arrived when out of nowhere more than 60 people were in the crosswalk in front of me. Even the parking lot was upscale. The ground floor is more like the lobby of a ritzy hotel. I actually had to double check to make sure I was in the right place. 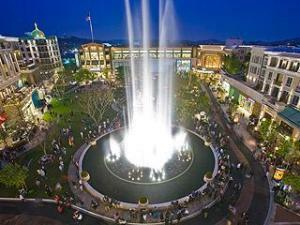 Known for being an upscale Glendale shopping area, the open-air Americana at Brand features many posh upscale retail stores like Barneys, Juicy Couture, Tiffany & Co., Armani and literally dozens more. Warmly greeted by Frank Sinatra in surround sound, I wondered if the residents living in the condos directly on top of the mall could hear the music from inside their homes? In the center of all these fine stores is a large pond shooting jets of water, which at first seems at random, but as Frank Sinatra intensifies so do the sprays of water. But don’t be fooled… Be on the lookout for a special treat: when the music starts to grow louder, the water displays actually come alive with full blown productions of water dancing and music blasting. Everyone watches quietly, and when the music and fountains calm down everyone simultaneously resumes whatever they were doing prior to being captivated. What a place to spend some money! People are everywhere, but not in a “chaotic mall” kind of way. This ambiance feels like a bustling community coming together at a nice, safe place. Next to the pond is the greenest, most well-manicured lawn I have ever seen… and I was raised on a sod farm. Every detail makes shopping here feel glamorous, as if simply being here causes endorphins to be released... When I thought it couldn’t get any better, a trolley passed by ringing its bell. The strange part of experience here was that although there were so many people at Americana at Brand, all of the retail stores were painfully empty. Easily less than 5% of people were holding shopping bags. Everyone was at Barnes & Noble, the movie theater, Coffee Bean & Tea Leaf, Pinkberry, and basically any place where you could spend just a couple bucks to hang out. Outside cart vendors selling yummy snack and fashion jewelry attracted lots of business. Many patrons seemed to adore the Potato Corner and its famous flavored French fries, a true taste of Americana. Cart vendor F&M Jewelry had a continuous flow of shoppers, as compared to the lonely Tiffany & Co. It’s apparent that most people are here simply to spend time together, and don’t seem to have the intention of doing anything more than window shop from afar. So maybe we’re not shopping as much right now, but we still have to eat. As the dinner hours approached, hungry parties filled up Frida Mexican Cuisine, Cheesecake Factory, Katsuya sushi, and Jewel City Diner, the areas more popular eateries. Glendale shopping doesn’t get any ritzier than this. For some awesome and easy fun, I highly suggest grabbing some tasty grub at any of Americana at Brand’s eateries and throwing a small blanket on the world’s greenest lawn for an urban picnic.